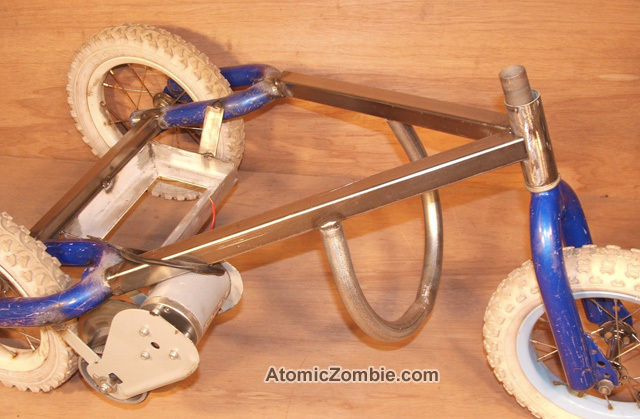 This image shows the drive motor and all three wheels installed on the basic trike frame. If I hold up the drive wheel and drop the motor wires across the battery, the drive wheel hums along, and seems to power the trike with a reasonable amount of force when it is on the ground. Take note of which way the wheel turns according to wire polarity, so you don’t end up with a backwards moving vehicle after finalizing the wiring. Yes, the scooter wheel must turn in the opposite direction of the trikes rear wheel, or counterclockwise to move forward. 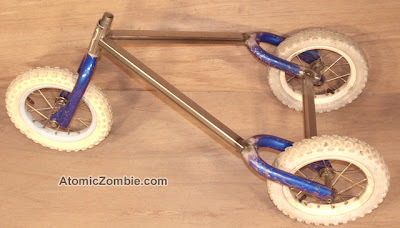 If you have a large double pole, double throw switch, then you could even add a reverse function to the trike. A very simple foot rest can be made with a piece of bent tubing, or a pair of conduit elbows welded together as shown here. Again, I try to use up whatever bits of scrap tubing are laying around the garage, so feel free to experiment with whatever foot rest designs you think will work. The seat will be placed over the battery, helping protect the wiring, and to keep meddling hands out of the electrical bits. 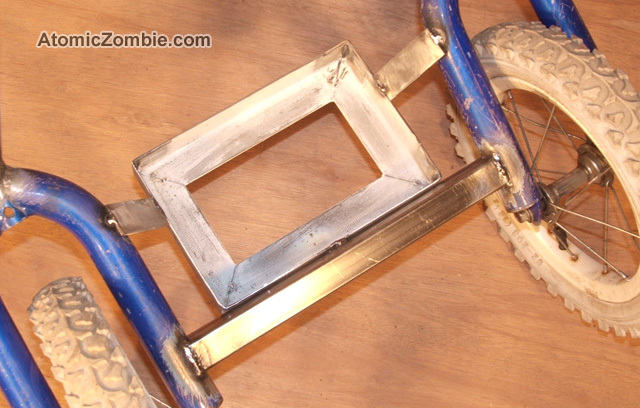 Using some ¾ tubing, or whatever scraps you have in the junk pile, make a basic seat frame like the one shown here that can be welded to the frame, allowing the seat to cover the battery, yet also allow the removal of the battery. 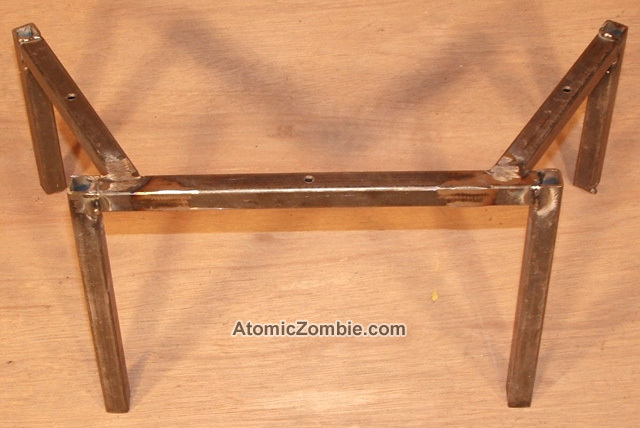 An old kitchen chair with metal legs is a good source of metal for the seat frame as well as the seat cushion. There is nothing critical about the seat frame other than allowing a comfortable sitting position and easy removal of the battery for charging or swapping. The simple seat frame shown in this photo allows the battery to drop into the battery box from the front of the trike once the seat cover has been removed. Once you finish all of the welds and paint your trike, the young pilot will be able to hit the trails on a long running environmentally friendly vehicle. Of course, you have to do a bit of electrical wiring first in order to transfer electrical power from the battery to the motor, but since it is a simple matter of adding a switch in series between the two, there is no need for a circuit diagram. Just run one wire from the battery to the motor and then one from the other battery terminal to you switch, and then from your switch to the other wire on the motor. If your scooter came with a throttle switch like mine did, then simply install the electrical system exactly the way it was on the scooter. If you have no throttle switch, then find a contact switch that can handle your motor’s power (5-10 amps typically), and you are ready to roll. I also added a front pull brake to the completed trike shown here although it was probably not really necessary due to the limited top speed and the fact that it stops moving within a few feet once the throttle is off. 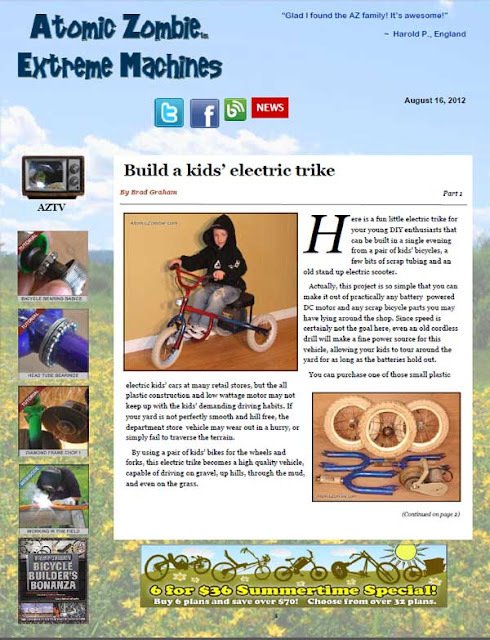 The completed kid’s electric trike runs for many fun hours on a single battery charge. 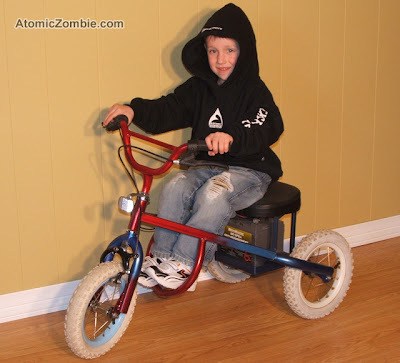 Top speed is limited to a “kid safe” level due to the lower voltage, and even if the trike stalls, the motor will not burn out because there is a limited amount of slip in the friction drive. 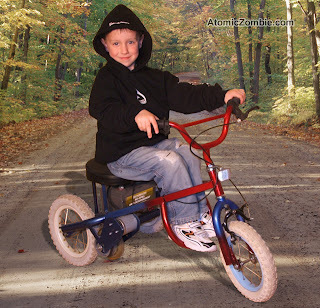 This trike is so well behaved that it could be used indoors, and if you install white rubber tires, there will be no track marks on hardwood or linoleum floors. 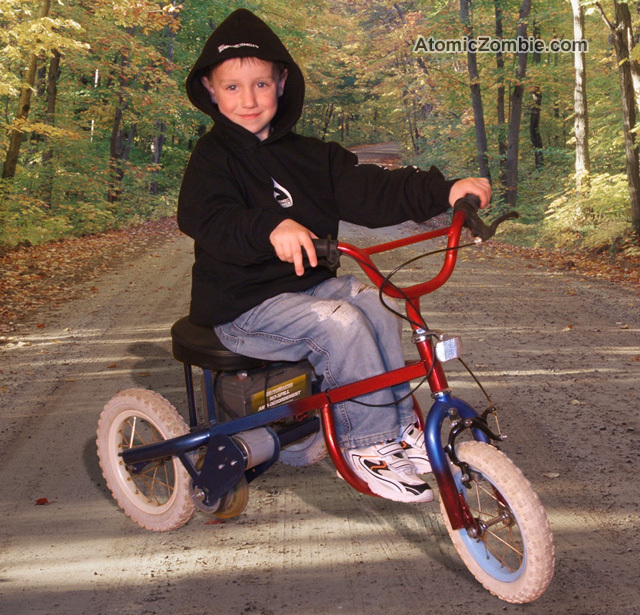 Oh, and yes, the trike can also move a fully grown kid around, as I have found out! Be safe and have fun. "Front drive, rear steer, original design. Very quick steering but rock steady. Don't believe the critics!" 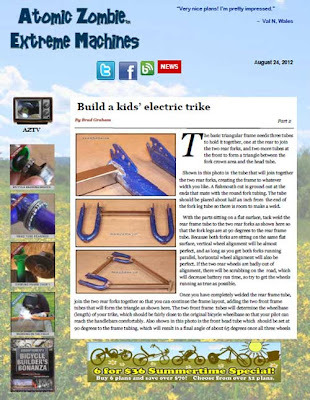 Featured article: "Build a Kids' Electric Bike, Part 2"
Freewheel and disc brake adapters for your bike projects for sale. More parts coming in September. Summer special: 6 plans for only $36! 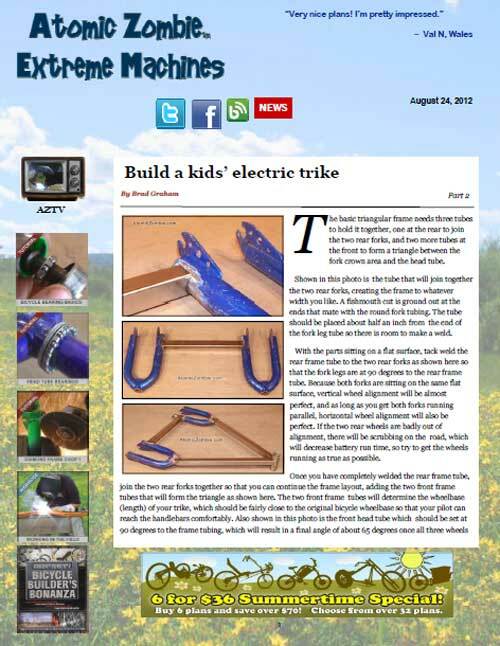 This and other AZ newsletters are here. I modified a home built FWD low-racer that I'd purchased a few years ago from a builder in Portland, OR for arm power and loaded touring. 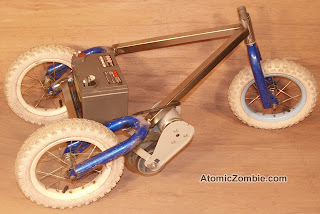 Here is a fun little electric trike for your young DIY enthusiasts that can be built in a single evening from a pair of children’s bicycles, a few bits of scrap tubing and an old stand up electric scooter. Actually, this project is so simple that you can make it out of practically any battery powered DC motor and any scrap bicycle parts you may have lying around the shop. Since speed is certainly not the goal here, even an old cordless drill will make a fine power source for this vehicle, allowing your kids to run around the yard for as long as the batteries hold out. You can purchase one of those small plastic electric kids cars at just about any toy store, but the all plastic construction and low wattage motor may not keep up with the kids demanding driving habits. If your yard or park is not perfectly smooth and hill free, the department store vehicle may wear out in a hurry, or simply fail to traverse the terrain. By using a pair of kids’ bikes for the wheels and forks, this electric trike becomes a high quality vehicle, capable of driving on gravel, up hills, through the mud, and even on the grass. Since kids’ bikes come in many sizes, with wheels measuring 10 inches, 12 inches, 14 inches, and 16 inches, you should not have any problem scrounging up the parts for this project by visiting the local dump or hitting the yard sales around the neighborhood. The parts are really not critical, but you will want the two front wheels and two front forks to match, at least for size and shape, since they will be placed side-by-side on the trike. 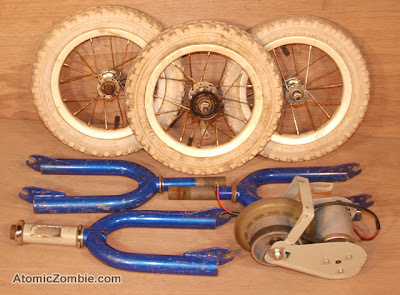 This photo shows the basic parts that will be needed in order to put together the kid’s trike. You will need three bicycle wheels (two of which should match), three front forks (two of which should match), one head tube and bearing set to match one of the front forks, and some type of DC motor that can power one of the wheels. 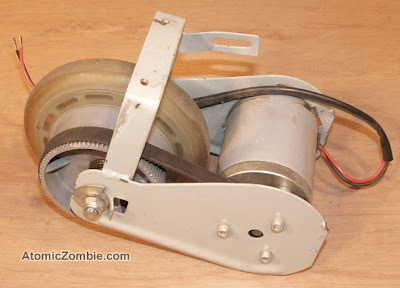 I chose an old stand up electric scooter motor as the power source because it could be placed against one of the trike wheels to make the vehicle move, thus requiring no transmission, gears or chains. 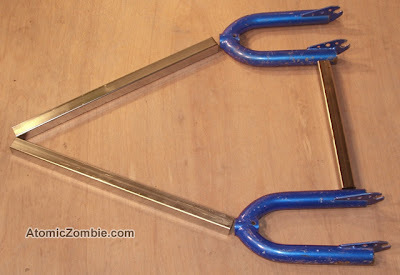 These little stand up scooters are also plentiful at yard sales and scrap piles, since it is often the frame that bends before the motor fails. 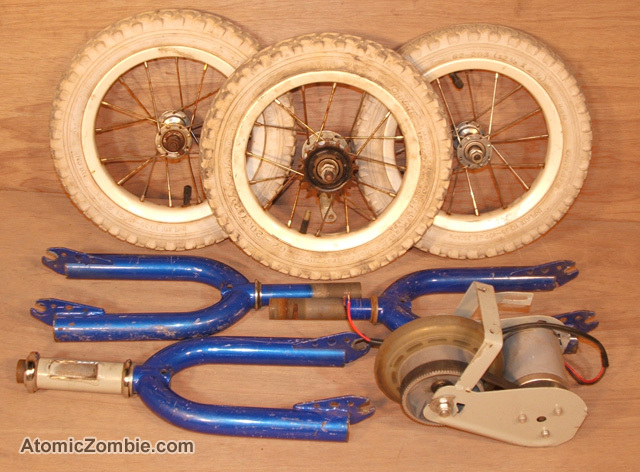 As shown here, you will need these components for the front of your trike - a front fork and matching head tube with all included bearing hardware. This head tube actually came from the electric scooter, and it just happened to fit the kids bicycle fork stem perfectly. With all of the bearing hardware installed, the fork will spin freely and without friction, which is a sure sign that all the hardware is properly matched. 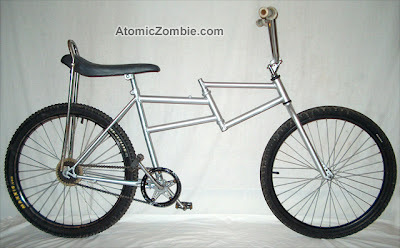 If you take your front forks and head tube from the same bicycle, then you will be certain that all hardware matches. 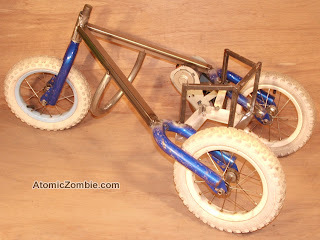 To make the kids trike, you need two wheels and forks for the rear and one front fork, wheel and head tube. For this reason, the two rear wheels and forks should match, and the front wheel can be whatever size you want. 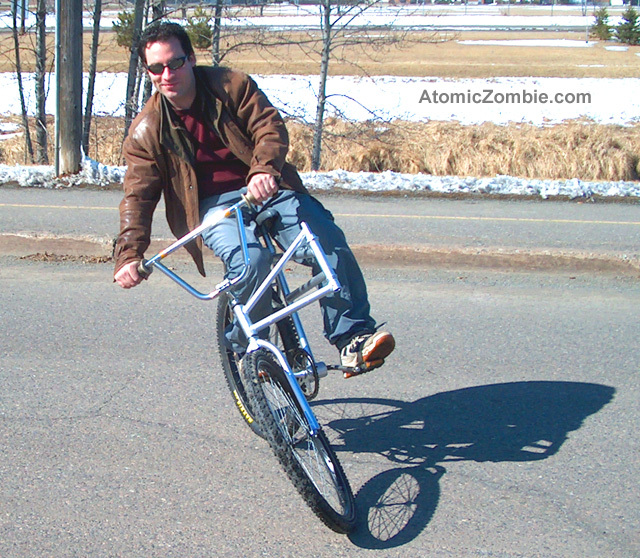 On my trike, I decided to use three matching wheels since they were easy to locate, and I also used a front fork that was slightly larger than the two at the rear. You will also notice that all the wheels are actually front wheels, since there is no drive chain needed you will not need a wheel with a sprocket attached. You could use a rear wheel if you cannot locate three front wheels, but a little force will be needed in order to widen the fork legs to take the larger diameter rear hub and axle. Most cheap stand up electric scooters have a 100-300 watt motor connected to a small rubber wheel, like the wheel you would find on a road skate. 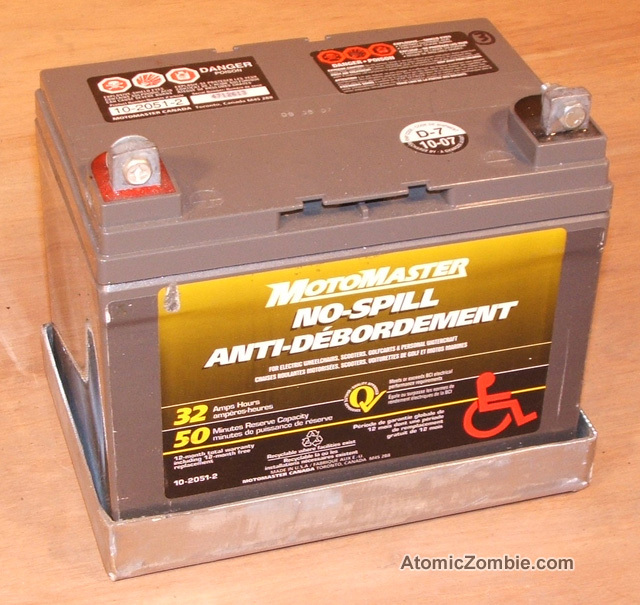 These motors will typically move the scooter at a speed of 15 to 20 miles per hour when using a good 24 volt power source. 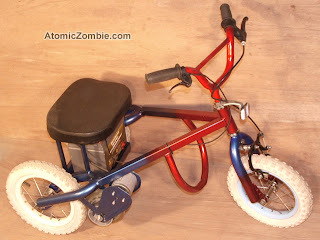 For use on a kid’s trike, I decided to use only one large 12 volt battery, reducing the top speed to about 10 miles per hour, but extending the run time by many hours. Since the motor already turns the small rubber drive wheel, all you need to do is let it rub against one of the trike wheels, and you will have a simple friction drive transmission system. Whatever speed the scooter would be capable of will be the top sped of your trike, since there is no gear reduction. 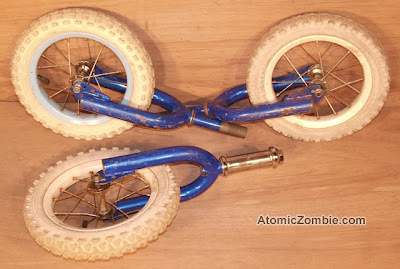 As long as the scooter drive wheel is turning the bicycle wheel by contact at the edge of each wheel, there is a 1:1 gear ratio, so wheel size makes absolutely no difference to the final speed of the vehicle. Cut the stem from each of the rear forks just above the crown as shown here, being careful not to nick the top of the fork leg tubing. 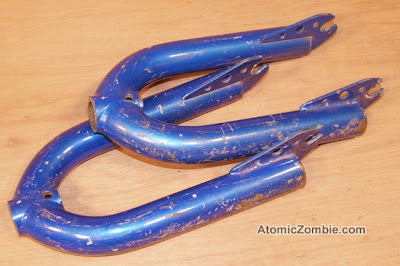 The cut area will be the point at which you will attach your new frame tubing, as this is the strongest area of the fork. If for some reason your forks are not exactly the same, try to cut each stem so that the distance from the axle to the cut area will match on both forks. 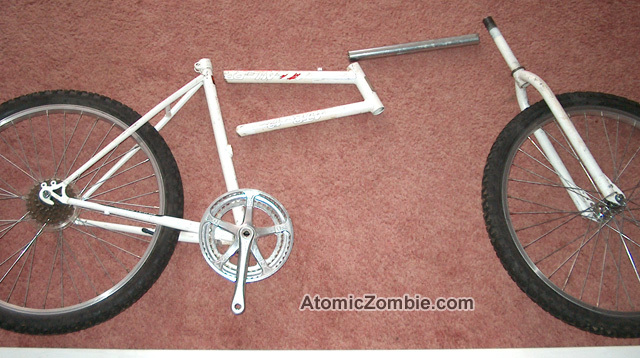 Since I am building this kid’s trike from parts I already had around the garage, I simply placed the two rear forks on the ground and found a pair of 1 inch diameter square tubes that would create the triangular frame as shown here. I think the square tubing came from an old table I hacked up, but since the trike is only going to hold the weight of a child, you don’t need to use heavy tubing. As for the size of the frame, simply have your young pilot sit on a chair, and make some basic measurements of how much room they will need in order to sit comfortably between three wheels. I went for a wheelbase about the same as the original bicycle, and a width of about the same as the wheelbase, creating an equilateral triangle footprint. Thanks to Gregory Mone, Science writer/novelist, contributing editor for contacting us to do a write up for the September issue. 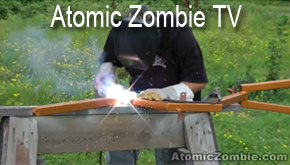 AtomicZombie loves Popular Science! Featured article: "Build a Kids' Electric Bike"
Here is the completed and unpainted SideWinder ready for its first test run. For best results, I found that a taller set of handlebars were optimal, and did not bother with any gears or brakes since this was mainly going to be a parking lot fun bike. To make a single speed, put the chain on the center chain ring on the rear wheel and cut the chain to fit. 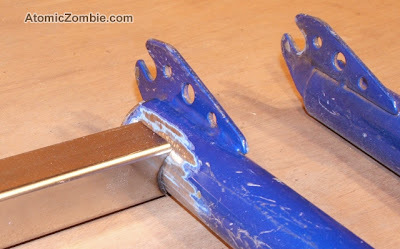 If you do intend to add a brake to your SideWinder, then only add a rear brake as a front brake will cause an instant and brutal jackknife to occur due to the front end wanting to fold into the rear of the frame. The initial test ride went as well as can be expected on such a crazy bike, so I painted the frame and switch to a banana seat to make it easier to shift weight around when doing stunts. The SideWinder ended up being a very fun bike to ride, once I mastered the ability to pull the front wheel only inches away from the rear wheel while in motion. The SideWinder can fold almost right in half, making it a unique variable wheelbase bike that can turn around in about the space of a single sidewalk block. By shortening the wheelbase, the turning circle is drastically reduced, making the sidewinder seem as though it can spin in a circle or slither around a corner in ways that defy logic. Find a nice quite place like a parking lot for your initial test ride (crash test). You will probably find it easy to ride the SideWinder while it is in the relaxed (straight forward) position since it is not much different than a regular bicycle except being slightly longer. Get moving at about a jogging pace and then pull the handlebars towards your body as you kind of swing to once side, turning a bit in the same direction. At this point, the frame will pivot, and you can bring the front wheel closer to the rear wheel. If you keep steering straight ahead, then the bike will tilt backwards yet still ride somewhat normally, although it will look like a train ran over your frame to onlookers! Once in the folded position, try to steer towards the direction of the frame pivot, and you will be able to zip around in a very small circle. Of course, you will probably jackknife and face plant a few times as you get used to the odd feeling of riding a folded bike with a 12 inch variable wheelbase! Keep practicing and you will be able to do all kinds of bizarre turns and slithers in no time. One of my favorite things to do on the SideWinder is to ride towards someone so everything looks normal, but just as I get within a 20 foot distance, I crank the frame into a tight fold and do a few loops, switching to the other side right after to complete an unbelievable figure 8. To the unsuspecting onlooker, it would appear that my bike just experienced a total frame failure, but somehow I was able to keep riding it! 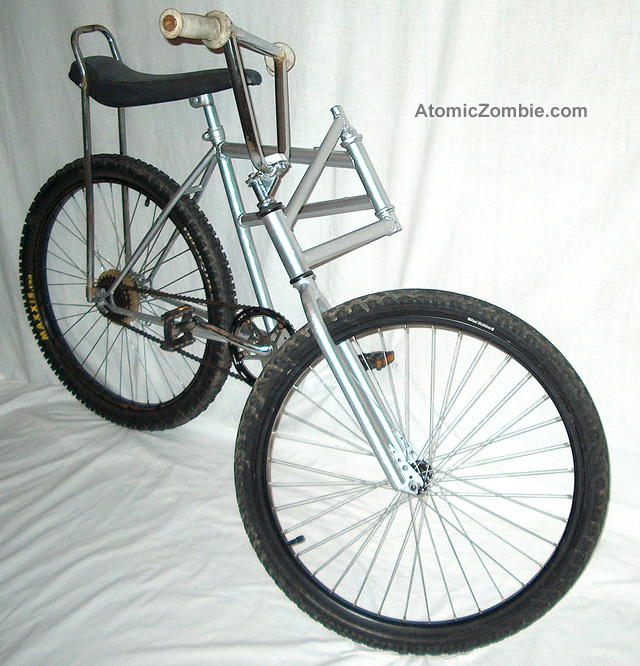 Of course after a few turns, it becomes apparent this is no regular bicycle, but in fact a circus ready stunt bicycle. Be safe and have fun! The SideWinder is a bizarre folding bicycle that pivots in the center of its frame while in motion, causing the wheelbase to shorten up for some seriously wacky steering tricks. You can turn the SideWinder around in about 2 feet of space, making it slink around corners and spin around in place until you are too dizzy to keep riding! 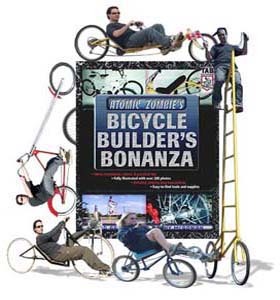 When it's not folding around corners, the bike handles just like any regular bicycle, so it can be ridden for long distances under normal control. 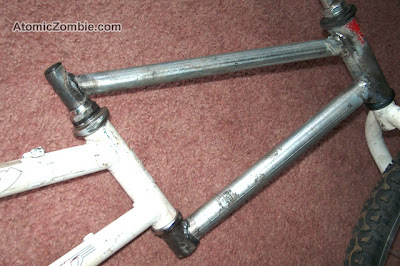 You can use practically any ordinary bicycle frame in order to build your own SideWinder, but this ladies frame shown here is optimal due to the placement of the top tube and down tube. 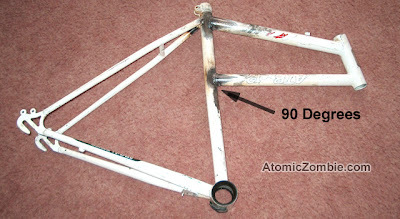 Start by chopping the frame as shown here at the end of the down tube where it meets the bottom bracket and at the end of the top tube where it meets the seat tube. Once you cut the tubing, use a sanding disc or hand file to remove any sharp leftover tubing at the bottom bracket and seat tube joint. There are no strict measurements and angles when building the SideWinder, so you need to install your wheels and cranks to determine the position of the frame tubing based on the parts you are using. The goal is to build a frame that pivots just ahead of where you knee will reach its furthest when pedaling and to ensure that the pedals have about 3 inches of ground clearance just as they did on the original cycle. As shown in this photo, the original head tube is relocated so that it is about 14 inches from the seat tube, at an angle very much the same as it was originally. This slight upward head tube angle helps the frame stay in the non-folded position when you want to ride it normally. The other piece of tubing shown here will extend from the pivot to the head tube that will carry the front forks and handlebars. The front steering head tube is also placed at the same angle as on a regular bicycle, so both head tubes are at the same angle. Weld the chopped front frame section back to the rear frame section as shown here, placing the head tube about 14 inches away from the seat tube at the same angle as it was on the original frame. If you are using a ladies bicycle frame like I am, then you don't have to alter the front section of the frame - just flip it upside-down and it will work perfectly. If you are using a standard diamond frame, then you need to cut one of the tubes so that the lower tube forms a 90 degree angle with the seat tube as shown here. Of course, none of these measurements are absolutely critical, so feel free to experiment. To create a frame that can smoothly fold in half in the center, we will utilize the original fork stem since it already fits perfectly in the head tube. Cut the fork legs from the fork stem right at the crown area and then clean up the leftover metal with a grinding disc. Find a 14 inch long piece of frame tubing or conduit and then weld it at 90 degrees to the fork stem at the crown area where you just removed the fork legs. 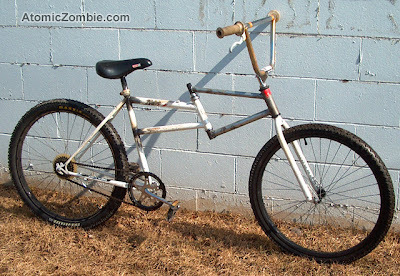 At the other end of this tube, you will install another head tube that will carry your front forks and handlebars. 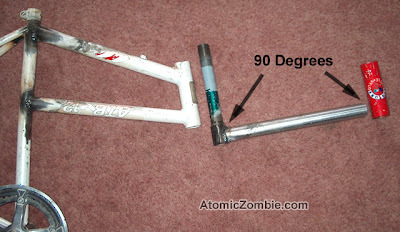 As shown in the photo, both the fork stem and the new head tube will form a 90 degree angle with this new tube. The size of the new head tube is not important as long as it fits the front forks you intend to use. Once you have welded the lower swingarm tube to both the base of the fork crown area and the front head tube, install another tube to become the top swingarm tube as shown here. This tube will be welded to the base of a steel gooseneck that has had the clamp section ground off and then to the front head tube as shown here. One thing to note is that you will not be able to remove any of the swingarm fork hardware once this welding is done, so clean and grease your bearings and install all of the hardware properly before welding this tube into place. These tubes can be recycled from another frame or you can use thin walled electrical conduit like I did. 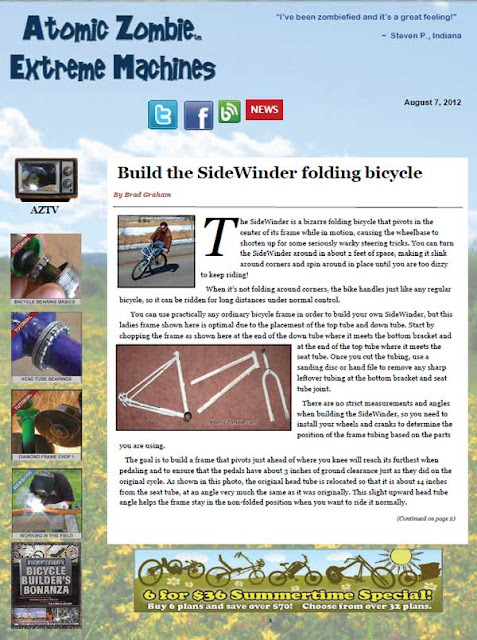 Featured article: "Build the SideWinder folding bicycle"
Freewheel and disc brake adapters for your bike projects now for sale! 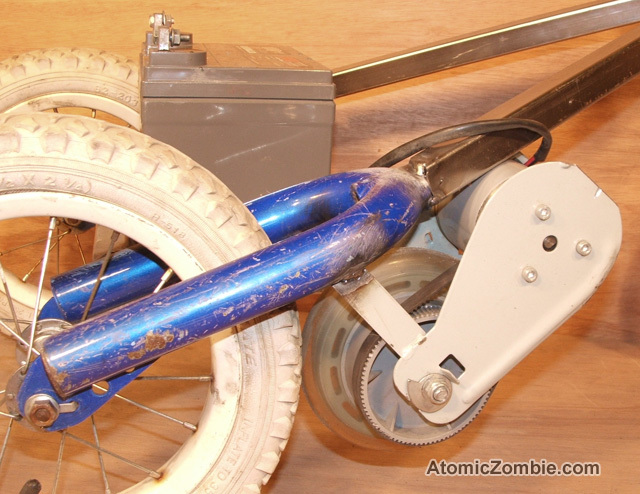 The latest Atomic Zombie bike project: FrontRunner Front Wheel Drive Recumbent, a unique front wheel drive bike that is fully adjustable and can fold in half for transport or storage.